Dreaming of vacation? 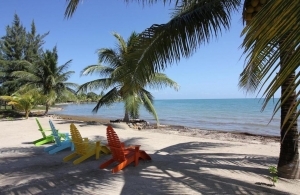 If you’re looking for an unBELIZEable place to stay, may we suggest a slice-of-paradise spot known as Sirenian Bay? We may be biased, but we think it has everything going for it – too much to mention in one short post, that’s for sure! So we’ve narrowed it down to the most important ones. Placencia is Belize’s artsy, beachy heart. Right at the tip of the Placencia Peninsula, it’s a quiet seaside town brimming with palm trees, sparkling ocean views and laid-back souls. From adventure to culture to jungle expeditions to fun in the sun, we’ve got it all! With hundreds of feet of semi-private white sand beach to call our own, we’ve got beachside relaxation all wrapped up. Go paddle boarding, kayaking or snorkeling – or just kick back with a book under a palm tree or the palapa. When Placencia’s not relaxing, it’s partying. From the Lobster Festival to the Art Walk, we’re in prime position for celebrating the best that Belize has to offer all year around! Bring your appetite and your dancing shoes, and get ready to celebrate! Whether you’re a pizza fan, dessert aficionado or coffee fiend we’ve got the local recommendations you need! Ask us, and we’ll guide you towards the cinnamon rolls at Maya Beach Bistro, fresh seafood at Omar’s, and a huge scoop of rum and raisin at Tutti Frutti gelato! Each villa at Sirenian Bay is the result of years of love and passion, and it shows! From the large, luxurious Manatee Villa to the romantic, cozy Turtle Villa, Sirenian Bay is a place where life-long memories are made. Perhaps you want to visit Monkey River or head out to the Cayes. Maybe you’re interested in ancient Mayan Ruins or chocolate-making traditions. We’re friends with everyone you need to know, and we can connect you with the people who can make your vacation dreams happen! Our on site hosts are our rockstars, ready to help you relax and enjoy! Elected to have your meals prepared? Everyone raves about Christy’s cooking. Need a ride into the Village? David’s got you covered. They’ll take care of the Villas… and take care of you. Driving in Belize takes some getting used to. We offer complimentary transportation for nearby destinations – and we can help out with golf cart and rental car hire. Plus, if you need some help getting to the airport and back, we can make that happen, too! Sirenian Bay has become a destination for family reunions and celebrations, which warms our hearts! From game night to sports to off-site activities, we’re all about making sure that every generation of your family has plenty to do. After all, the best vacations are where everyone is included! We’re here to ensure that your vacation is nothing short of spectacular, and we want you to feel like you’re a part of our family. When you visit Sirenian Bay, we’ll welcome you with open arms – so much so that you’ll be planning your next visit before you even leave! Convinced? We’d love to have you! 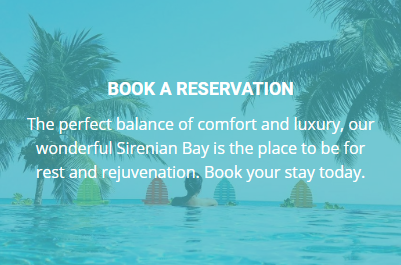 Get in touch to book your vacation at Sirenian Bay today!